Michelles new year’s resolution to have chickens in her humble 1 acre backyard already continuing well into October with this tin roof going on the chicken coop. Her husband, Shannon wants to build a large coop so their (initially three) chicken flock can roost high off the ground. A lighting system inside will hopefully enable the chickens to lay eggs year-round. The coop footprint is 7 1/2 feet by eleven feet. Thought six would be enough but in fact it took 7x two and a half feet wide roofing tin sheets (despite the maths!). 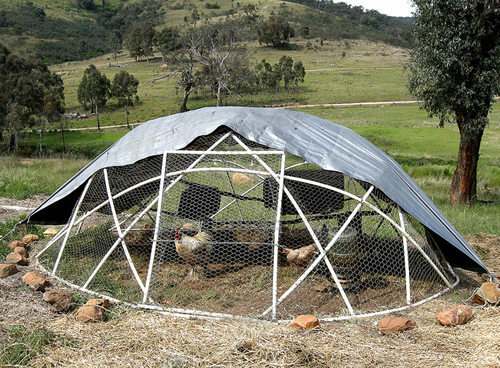 A chicken tractor is a small moveable coop which can be used to prepare garden beds (once your chickens have fertilized and turned over one area, they are then moved on to another) or simply as a space saver where you move them around to a fresh area of your backyard when needed. To be honest, they are not my favourite type of chicken housing, especially for small backyards where it is likely to become essentially their permanent (very small) home. But it is quite a nice idea for sustainable gardening to have rows of chicken tractors being moved along and then adding your mulch etc to what has been left behind them – and of course chickens are more than happy to scratch around and poo on new grass every few days. So I do kind of like the ideas behind them but don’t feel overly comfortable with the idea that a small moveable tractor coop might be all the chickens ever know (although I am sure that is still 100 times better than being in a cage). The good news is they are quite simple to build – a few 2x4s (or even pvc pipes) and some strong galvinised wire and you can very quickly have the framing for the tractor pen finished. I recommend having an enclosed area of the tractor for shade and also as somewhere they can huddle behind in case something tries to get at them. The top and sides should be covered with strong small-holed wire, but the bottom should be left so they can get direct access to the ground (it is also likely to hurt their feet if the wire was on the bottom as well). The video below gives instructions for building a chicken tractor onto a raised garden bed – in this example they will live there for a month and are then moved onto another raised bed somewhere else. Three months later the first raised bed they prepared is ready for use. The main reason for building a chicken coop in the first place is that you have, or are getting chickens and apart from making great pets and being therapeutic to watch pecking around your backyard, the main reason for getting chickens is to have some eggs. It may seem obvious to many, but chickens come in many different breeds and some of those breeds are better than others at laying eggs. 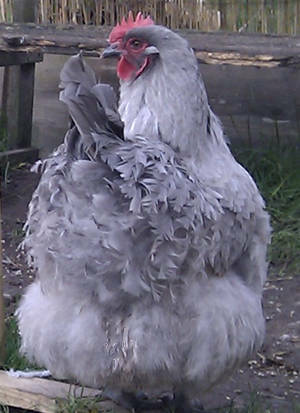 Some breeds are more ornamental with feathered feet, frizzled feathers or feathers covering their eyes so they look like little balls of fluff, other chicken breeds are more for the table and will eat themseves silly until they can hardly walk – for eggs you need a breed of chickens that will lay good size eggs fairly consistently. I might aswell also clear up here that to get eggs you do not need a rooster. In fact in some instances a rooster may hinder your hens laying as they can become stressed by an over-amorous cockerel and shut up shop altogether. If you haven’t yet ordered any chicks and are intending to order from a hatchery that will ship them to you, ask for pullets only and make sure they do not add any extras to your order for ‘warmth’ as you can be pretty sure those will be roosters. It is sad that hatcheries are forced to get rid of so many roosters as the commercial egg industry, and most small flock owners (especially if they are living in urban areas) only want – or perhaps are only allowed to have – pullets (or maybe at the most 1 rooster) and of course nature says that a ‘straight run’ of chicks will be 50/50 girls to boys. Unfortunately that is just the way it is if you want to have egg laying hens as multiple roosters in a small backyard flock are likely to fight amongst themselves or worry the girls into not laying. Various breeds of chickens are known to lay eggs that come in many different colors and shades. These often range from the white eggs we know and have learned to love from the supermarkets to being dark and also chocolate brown in color (always the most appealing to me 🙂 ). In addition, there are blue and green eggs, cream colored eggs, light brown eggs and speckled eggs. Own a few different types of chickens that lay eggs in these colors and you could be set for a colorful hunt this Easter! Ameraucana hens are the famous blue and green egg layers. Developed in the United States, the name means American-Araucana. Besides laying exotic looking eggs at an above average rate, these birds are sweethearts. They are quiet, trusting, and very easy to keep in small yards. In a mixed flock, the Ameraucana often becomes the owner’s favorite. Australorps are known to be egg laying machines. Their friendly, docile nature also makes them great pets if you have kids, or your a first time chicken owner. If you are looking for a hen with both features, you simply cannot do much better than Australia’s national breed. Australorps are large black birds with bright red combs and wattles, though strains of white and blue (slate gray) Australorps are known to adapt to the cold winter months if you live in such a climate. In the 1920s, a group of Australorps set a world record by producing an average of 309.5 eggs in the course of a year. A single Australorp hen later set an individual record by producing 364 eggs in 365 days. Looking for a chicken who over produces on eggs? The Australorp will not fail you. Here is an unconventional choice that does not appear on most peoples’ lists. Cubalayas do not appear in many backyards either, but they are spreading as they gain favor for their good looks, egg production, and calm demeanor. Several hatcheries sell Cubalaya chicks and I have seen ads for breeders who sell hatching eggs or chicks as well. The breed was developed in Cuba from Asian stock which most likely originated in the Philippines. These chickens are tame, peaceful, and make great pets as well as being great egg layers (although can take up to three years to reach adulthood). They can handle confinement well. Cubalayas are still more popular in Cuba than elsewhere, but they have a devoted following. 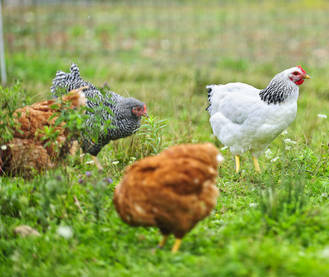 Delaware chickens tend to be quiet and friendly, lay plenty of eggs, and tolerate small living areas well. This breed originated in 1940 and is a cross between New Hampshire and Barred Rock chickens. Delawares were developed as a dual purpose bird (for egg laying and meat), so they are good sized, yet produce eggs at an above average rate. Orpingtons are big block shaped birds that provide a good rate of egg production. They have dual purpose characteristics, often used for meat as well, making them a good fit for small farms. Orpingtons are very friendly and easygoing, so they have become favorites in most backyard flocks also. To top it all off, they are quite cold hardy, which makes them suitable for northern climates. Ask people to imagine a chicken and many of them will think of the RIR. This is the classic brick red chicken with a rectangular, brick shaped body. While the breed is not as popular as it once was commercially, it is one of the most common varieties of backyard chickens and the hybrid egg laying breeds (which come under many different names but generally could be termed as production reds or blacks) will usually have Rhode Island Reds somewhere in their lineage. RIR’s lay a good amount of eggs with a low-key demeanor that keeps them popular. However, owners do report that these hens can be hot tempered and a little standoffish at times, an attitude that should mellow with time and familiarity around people. Leghorns are probably the most common commercial egg layers. They may not be the nicest, cuddliest breed on this list though. A few owners have described them as flighty and edgy, while others swear that their Leghorns are nothing but calm and tame. But these Italians chickens lay almost as many eggs as there are days in the year, so they are worth at least a look at. These birds are a longtime backyard favorite. Wyandottes lay quite well, handle confinement without complaint, and have a calm, carefree nature. They are a dual purpose breed, having good value as both egg layers and meat birds. Wyandottes were developed in the United States in New York in the late 1800s. Most people find them quite attractive, and probably the most common color variation is ‘silver laced’ which is where they tend to have swirled or spotted color patterns due to the dark highlights on the edges of their feathers (lacing is a color variation also found in other breeds). Many different colors exist and the highlighted edges on feathers are known as “lacing”. For example, a Gold Laced Wyandotte has predominantly gold feathers that are outlined in black, which does look a lot like lacing or netting.